This fancy diamond cut fringe is 3" in length from the stitched gimp to the bottom of the beaded strand. The stitched gimp is approximately 1/2" in width and the longest beaded strand is 2 1/2" in length. 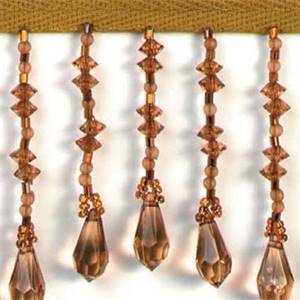 This fancy diamond cut fringe is a lovely accent to curtains, lampshades, costumes and home decor items. This item is available in 11 colors. Product comes in 5 yard continuous reel.